Guidance to ISOPTIK by " private car "
Drive pass by Fortune Tower Building and then stick on lane 2 from the left. Head straight pass Ratchadapisek Soi 3 and you will see a white wall from the people's republic of China embassy. Continue straight and stick to the left lane at the end of the white wall and be preparing to turn left to enter AIA CAPITAL CENTER building. The entrance will be next to the “ Stock Exchange of Thailand ” that will blind the entrance by its car , so switch to lane two on the left and go left next to it to enter AIA CAPITAL CENTER building immediately. For drop off passenger , inside the building area turn right 2 times for drop off passenger zone at the front of AIA Capital Center Building. Enter the building and ride the escalator to second floor and the take a u-turn on your right , you will see ISOPTIK sign 30 meters at the end of the corridor. For a driver , make a round right turn to enter a parking lot by using number 2 entrance and can be parked from 3rd floor. Take an elevator to 2nd floor and exit with your right door to enter a plaza zone which is located on your right hand side. Walk straight by 30 meters by sticking to the right and you will see ISOPTIK at the end of the hall way on your left side. Enter a building’s parking lot by using number 1 entrance and inform the officer for the wheel chair requested and the desire to go to ISOPTIK , The Hi-End Eyeglasses Centre. When you finished parking your car , turn your front into the building and you will see two entrance. Using right entrance and go straight to enter a plaza zone. Take an elevator on your left side to 2nd floor. Exit an elevator and go straight by 30 meters , you will see ISOPTIK sign 30 meters at the end of the corridor. Guidance to ISOPTIK by " Taxi "
Inside the building area, turn right 2 times for drop off passenger zone at small building in the front of AIA Capital Center Building. 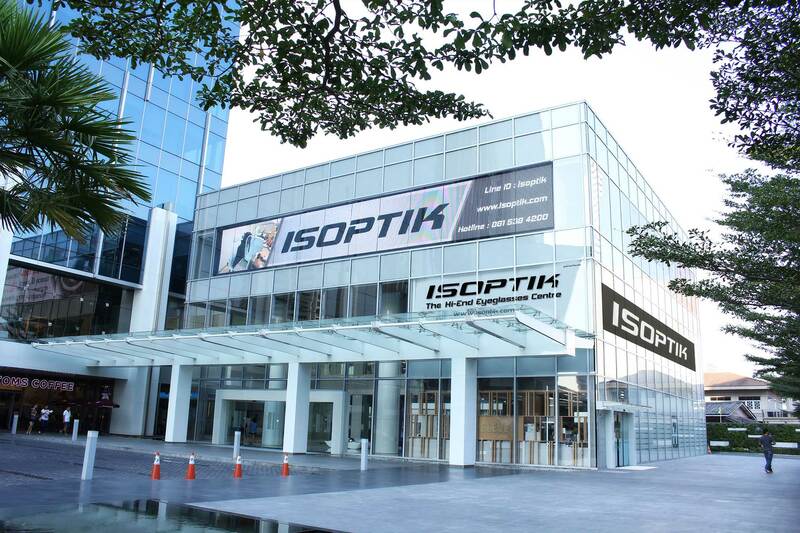 Enter the small building and turn left to ride the escalator to second floor and the turn right , you will see ISOPTIK sign 30 meters at the end of the corridor. Guidance to ISOPTIK by " public transportation bus "